The technology could be "irresistible" for nation-states to use in disinformation campaigns. 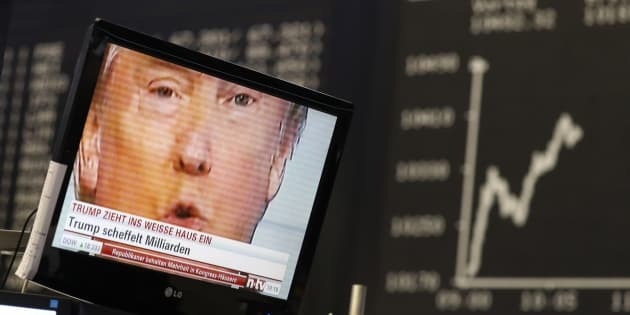 A TV screen showing Donald Trump, then the president-elect, at the stock exchange in Frankfurt, Germany, Nov. 9, 2016. New "deepfake" technology could make it practically impossible for viewers to know when they are watching a fake video. When an average person can create a realistic fake video of the president saying anything they want, Farid said, "we have entered a new world where it is going to be difficult to know how to believe what we see.'' The reverse is a concern, too. People may dismiss as fake genuine footage, say of a real atrocity, to score political points. A foreign intelligence agency could use the technology to produce a fake video of an American politician using a racial epithet or taking a bribe, Rubio says. They could use a fake video of a U.S. soldier massacring civilians overseas, or one of a U.S. official supposedly admitting a secret plan to carry out a conspiracy. Imagine a fake video of a U.S. leader _ or an official from North Korea or Iran _ warning the United States of an impending disaster. "It's a weapon that could be used — timed appropriately and placed appropriately — in the same way fake news is used, except in a video form, which could create real chaos and instability on the eve of an election or a major decision of any sort,'' Rubio told The Associated Press. "Within a year or two, it's going to be really hard for a person to distinguish between a real video and a fake video,'' said Andrew Grotto, an international security fellow at the Center for International Security and Cooperation at Stanford University in California. "This technology, I think, will be irresistible for nation states to use in disinformation campaigns to manipulate public opinion, deceive populations and undermine confidence in our institutions,'' Grotto said. He called for government leaders and politicians to clearly say it has no place in civilized political debate.